This case is perfect for those overnight business trips with storage area for your Apple MacBook Pro 13.3-, 15-inch or the new MacBook Pro Air. In a seperate area you will find another compartment made especially for your everyday needs. *Restocking fee of 20% applies to this product. 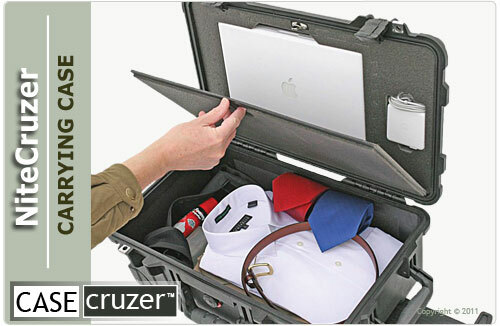 Enjoy flight to freedom with first class Pelican case that provides superior mobility and protective compartment for a Mac Book Pro! PSC100 - All in-one camera & laptop carrying case, holds one 13 to 17 inch laptop in the lid and photography gear inside the adjustable padded divider. 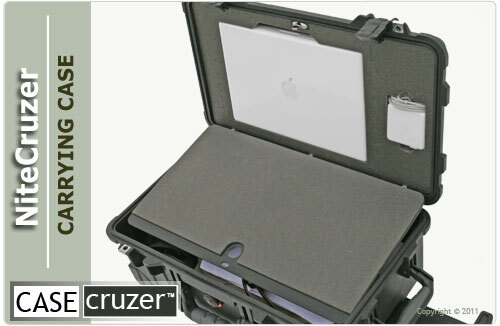 Photo StudioCruzer Carry-On Case for 13.3 - 15 or Air Apple Laptops & Camera equipment. NiteCruzer the protective Laptop Case / Overnight Carry-On for the MacBook Pro with lots of room for all the essentials of business and pleasure travel. 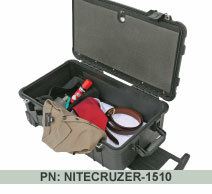 CaseCruzer, IMCruzer, Photo StudioCruzer, NiteCruzer, LaptopCruzer, and WineCruzer are trademarks of CaseCruzer, LLC.